As you can see, the pleasure is not all mine. 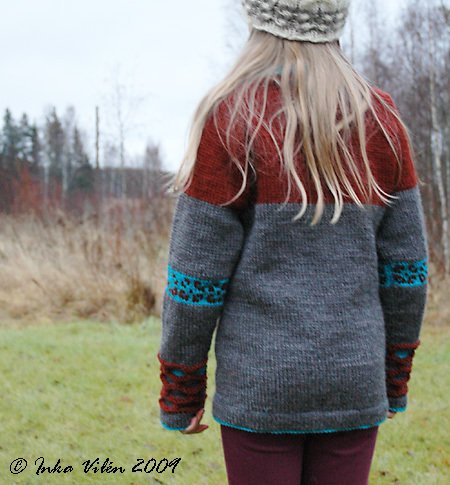 The pattern by Villapeikko is simply great. I loved knitting the cardi all the way. The pattern is very well written: detailed and easy to follow, despite of the size. And of course the cardi has some great details to it, which made the knitting ever more interesting. The most interesting are, of course, the sleeves. They were the first to catch my eye: the play with colours and textures. They are The Thing in this design. The other was the i-cord in the front. It was a brand new thing for me, and knitting it in a satisfactory way took me a quite bit of knitting and frogging. The result, however, is just great: very neat and practical and yet fun to knit. The size I made was a peculiar combination of the sizes in the pattern. First I must note that my gauge was a bit off, 19 stitches per 10 cm instead of 20 stitches. 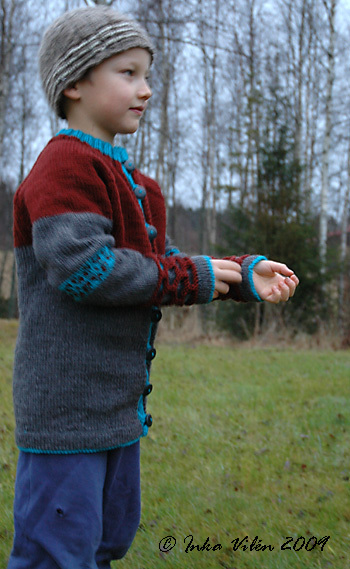 The width of the cardi and the raglan decreases were made according to the 4 year old’s size. 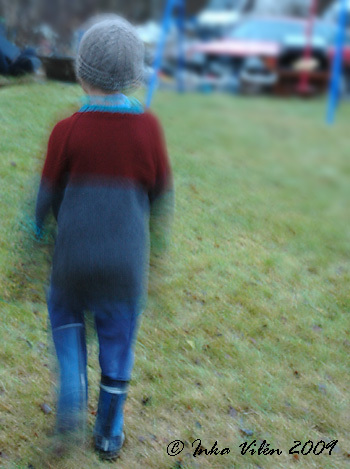 But the sleeves were knitted in the size of 6 year old. To make the sizing even more peculiar, I added a few extra rows for the upper part of sleeves and quite a few for the body. Therefore I also decided to have 8 buttons instead of 7 written in the pattern. But yes, despite of all the combining of the sizes, the cardi turned out to be perfect. 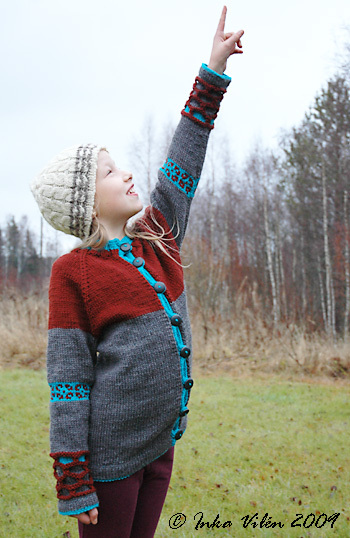 In the photo above the cardi is worn by a kid of 130 cm and very slim – perfect fit, except around the pelvis it might be just a touch wider. 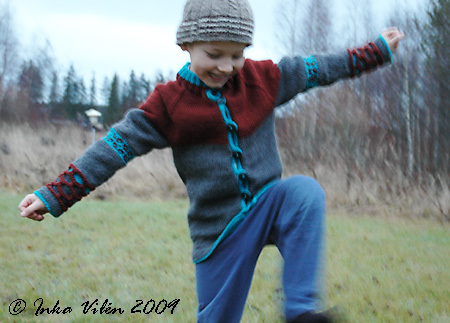 In the photo below the same cardi is worn by a kid of almost 120 cm, slimmish. There’s some extra length in sleeves and body to make sure that this cardi will fit also next spring and perhaps even in November 2010, too. The yarn is Cascade 220 Wool, 100% Peruvian wool (bought from Secretwool). The main colour is graphite gray, the contrast colour is coffee brown and the second contrast colour is turquoise. Cascade 220 Wool is sold in 100 gram skeins. 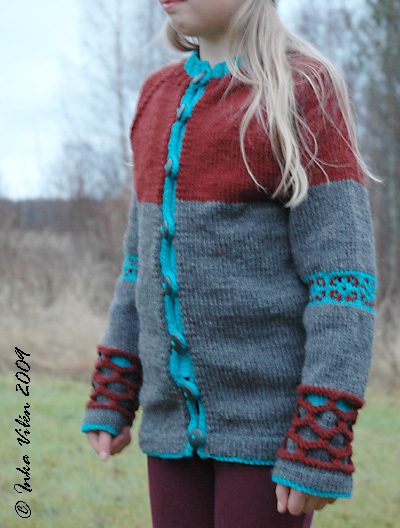 This cardi in this size took up 190 grams of grey, the whole skein of brown and 50 grams of turquoise. To be exact, I ran out of brown and had to knit the last few rounds of brown in the collar in turquoise, instead of brown. In smaller sizes one skein of the first contrast colour should be quite sufficient. Needles used were 4.5 mm in the body and 4.0 mm when the smaller needle size was required. And, as stated before, my gauge was a bit looser than in the pattern; 19 stitches per 10 cm. What a wonderful knitting experience this was! And what a great cardi this turned out to be. Thanks to the designer of the fabulous design and giving me a chance to do the test knitting. And thanks to my models, also, for patiently posing in the cold and damp weather. Well, patiently, up to a point. 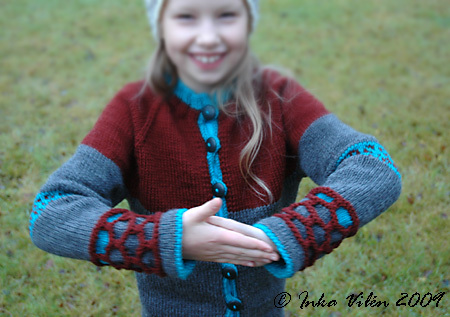 This entry was posted in finished, yarn work and tagged cardi, kid, testing, wool by Inka. Bookmark the permalink. Siitä tuli hieno! Kiitos itsellesi!